During September, you may have noticed some people with clipboards and safety vests observing sidewalks and bike lanes. 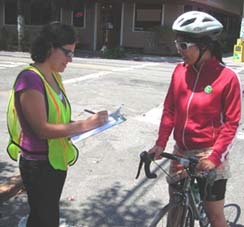 These counters were part of a major effort to determine how many people are currently walking and biking in our region. The counts will establish a baseline of walking and bicycling activity at key locations, so that changes in activity levels can be measured in 2010 after Nonmotorized Pilot projects and programs have been implemented. The count and survey data will also be used to better understand who walks and bikes and what their concerns are, so that the facilities and programs can respond to these needs and conditions.